Incorporated in 1886 by midwestern settlers known as the Indiana Colony, the City of Pasadena has grown into a world-famous tourist destination recognized for the beauty of its Tournament of Roses Parade, the excitement of the annual Rose Bowl, and the charm of the Old Town District. But what existed before the roses? Before it was Pasadena, this land was Hahamog’na, the ancestral lands of the Tongva people. Later, it comprised the heart of the San Gabriel Mission lands, and in the Mexican period, it became Rancho San Pascual. The 1771 Spanish conquest of this land set in motion several colonial processes that would continue into the twentieth century and beyond. 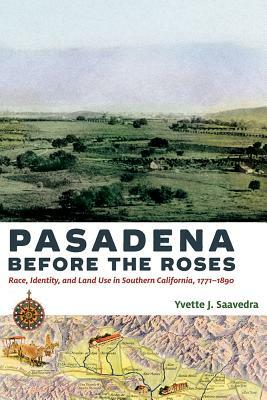 In Pasadena Before the Roses, historian Yvette J. Saavedra examines a period of 120 years to illustrate the interconnectedness of power, ideas of land use, and the negotiation of identity within multiple colonial moments. By centering the San Gabriel Mission lands as the region’s economic, social, and cultural foundation, she shows how Indigenous, Spanish, Mexican, and American groups each have redefined the meanings of land use to build their homes and their lives. These visions have resulted in competing colonialisms that framed the racial, ethnic, gender, and class hierarchies of their respective societies. Yvette J. Saavedra is an assistant professor of history at California State University, San Bernardino.